"Le Manoir de St Christophe is a truly magical house... The location is ideal with daily walks for croissant and bread just a few minutes away. It totally exceeded our expectations." "We had the most idyllic stay in this wonderful home that Véronique, the owner, has built and filled with warmth and love... As soon as we drove through the gates at Le Petit Mas our welcome set the tone for the rest of the week – full of smiles and wonder." "We really enjoyed our holiday. There was something for all the family. The villa was excellent and in a beautiful, quiet location, but with a small town nearby. We didn't want to come home!" Quintessentially French, the Dordogne is a chance to soak up the rural splendour of a lush, rugged landscape; of meadows and vineyards wrapping themselves around castle-topped villages and of a famous river effortlessly carving its way through it all. The river has come to lend its name to the entire département of the Dordogne, but that’s rarely what the locals call it. Here, the historical province of le Périgord is the preferred address; a nod to the area’s past when it was centre stage during the Hundred Years War. If the ‘Dordogneshire’ of British imagination exists, it’s found in le Périgord Noir – an idyllic corner of the world around the medieval town of Sarlat. Here, limestone cliffs have been holding fortified villages (known as bastides) high in the sky for 800 years. However, below them is the chance to be transported even further back in time. On the banks of the Vézère River, a Dordogne tributary, cave paintings have been discovered, some 12,000 years old. Together, forming Europe’s oldest and most precious museum of art, these are a UNESCO World Heritage Site and an unmissable glimpse into the life of Europe’s earliest settlers. Le Périgord Noir (meaning the Black Périgord) gained its name from the dark oak forests of the Vézère Valley, whilst it’s the purple hue of the Cabernet Sauvignon grapevines surrounding the town of Bergerac that inspired le Périgord Pourpre’s moniker. The colour white describes the area to the east – le Périgord Blanc – named for the area’s bleached limestone formations. And, north of them all, you’ll find le Périgord Vert with the greenest meadows, kept lush by cool freshwater streams. And between them all, countless towns and villages provide their accent of honey-coloured stone. As if the Dordogne Valley didn’t offer culture and beauty enough, there’s even more to be discovered south of its slopes. The département of Lot-et-Garonne offers an orchard-covered landscape peppered with bastide towns – and pretty Agen, famous for its prunes. Even further south, Tarn-et-Garonne offers a rich and varied landscape studded with its own bastide towns and with easy access to Toulouse. Downstream, where the Garonne River's waters swirl together with those of the Dordogne, elegant Bordeaux awaits true culture seekers: those with a thirst for historical drama, a vibrant art scene and, of course, award-winning wines. In the South West, you’ve found a holiday in the world’s largest fine wine vineyard. The area around Bordeaux is claret country, where people dedicate lifetimes to the pursuit of the perfect vintage – and where names you’ll recognise on the bottles in fancy restaurants adorn the gates of real-life châteaux. Drink in the prestige, unwavering tradition and the show, and when it comes to a glass of the real thing, order with confidence because here, like nowhere else, bad wine simply doesn’t exist. To get extremely excited about food in the Dordogne just means you fit in. Foodie traditions here are deeply rooted, with local duck in various guises making an appearance on all but the least French of menus. In the true south, cassoulet never forgets its Languedoc roots and it seems every village has its own take on this rich, hearty salute to white beans, duck and bacon. But, throughout the region, it’s the Toulouse grey goose who steals the show and it’s from these very villages and towns that foie gras hails – best when lightly sautéed and served with a fruit compôte. The true gourmand will search high and low for la perle noire du Périgord (the black pearl of the Périgord), a legendary black truffle most commonly used to infuse a simple omelette, but also found shaved sparingly over salads. And this isn’t the only fungus lusted after in south-west France. Mushrooms – especially the famous cèpe – are a serious business, often making their way into a sublime Sarlat-style potato dish, pepped up with garlic, goose fat and parsley. Aniseed-flavoured pastis may be the French national drink and apéritif de rigueur, but when you find yourself even remotely close to Bordeaux, order a glass of claret. Either that or a crisp, grassy sauvignon-based white. A little further up the valley, peppery reds cut through Périgord duck dishes perfectly – those from the Côtes de Bergerac and Duras a more affordable and very enjoyable alternative to the Bordeaux rock stars. Further east still and the pinot noirs of Burgundy begin to make an appearance. Beyond dessert, Monbazillac stickies are a must. For something a little stronger, Cognac tastes as divine as it should on home turf, and look out for eau de noix – the local walnut liqueur – at its happiest paired with a slab of French cheese. 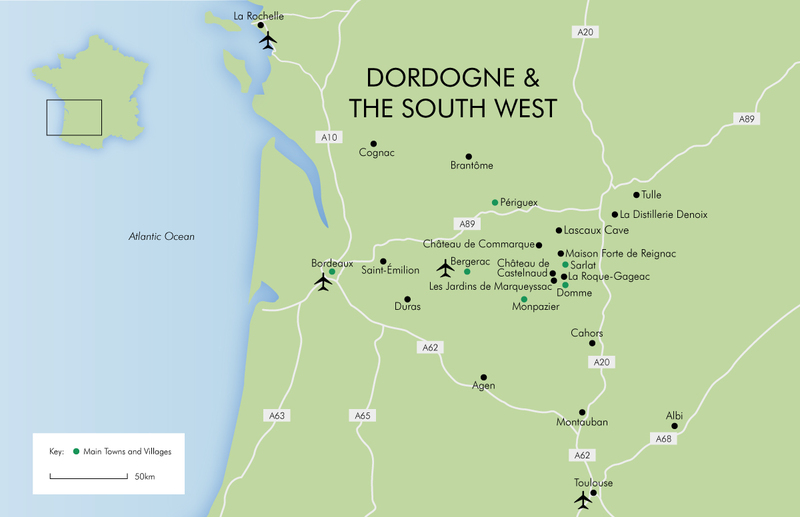 The capital of the Périgord region may sit many miles from the Dordogne River, but it has found itself very much at the centre of the action for over 2,000 years. Here, two chapters of history come together, with both Roman and medieval influences vying for attention. Everything is dominated by the beautiful Saint-Front Cathedral which can be seen for miles and was the inspiration for the Sacré-Coeur Basilica in Paris. Visit Périgueux on a Saturday and there’s a colourful market too. Sarlat-la-Canéda, to give the town its full title, is a wonderfully preserved 14th-century maze of cobbled streets and is famous for its vibrant night market – a celebration of truffles and foie gras. You can look down on proceedings from high above the rooftops thanks to the panoramic lift inside the Sainte-Marie church bell tower and, when wandering the lanes, be sure to look up; the roofs of many of the 16th-century buildings here are tiled in a rare, carefully cut stone. Claiming the highest peaks and most advantageous positions of south-west France, bastides are walled, fortified towns and serve as a ready reminder that this was once frontier land – territory wrestled back and forth between English and French possession. Considered to be one of the best preserved in all of France (and the whole of Europe), Monpazier can also claim to be the most typical. A gorgeous, arcaded main square, home to a rather excellent Italian restaurant, is the focal point. Founded in 1213 by Philip the Bold, gorgeous Domme has avoided modernisation and retained its fortified walls and impenetrable gateways. The views across the Dordogne Valley are breathtaking, not least from the viewpoint near the town’s main square, la Place de la Halle. Don’t miss the towers of the Porte des Tours gateway, converted into prisons in 1307 when the town’s resident Knights Templars were arrested by the king. You can still see the engraved crucifixes they carved while imprisoned. With its jaunty half-timber buildings, the beautiful Vieille Ville quarter of Bergerac offers a more rustic medieval than the honey-coloured stone of so many other towns in south-west France. Once a major port along the Dordogne, the capital of le Périgord Pourpre continues to champion the art of fine winemaking, as well as a strong tradition of simple, honest trading – a farmers’ market in the pleasant ‘new town’ attracts eager customers from miles around. Bordeaux is said to boast the most graceful streets in France. Rich in history, this is a city with a tale to tell, though not a city that has forgotten to move with the times. Restored, regenerated and resplendent, the whole of Bordeaux is a UNESCO World Heritage Site – all grand boulevards and neoclassical splendour. But between the fancier districts, pockets with a more contemporary outlook can be found; chic restaurants serving food worthy of the town that can consider itself the epicentre of fine wine. Marguerite Duras, the 20th-century author and Academy Award nominee, was so taken with this quiet Aquitaine town that she named herself after it. It’s a destination best known for its ancient castle, founded in the 12th century, but also where the region’s excellent local wines come together. La Maison des Vins was set up to celebrate the region’s 200 or so producers and it’s a place for tasting sessions, festivals and expert insights into the fine art of winemaking. Straddling the Lot River with a 13th-century bridge to bring its halves together, Villeneuve-sur-Lot cossets its antiquity in the old town at its heart: a main street, the Rue de Paris, that runs between two historic gates where shops and a pleasant wander await. There’s a Tuesday and Saturday market in the arcaded Place Lafayette whilst the striking red-brick St Catherine’s Church and the art within the Musée de Gajac usually find their way onto visitors’ to do lists. Founded in the 13th century, and a stop-over for pilgrims on the road to Santiago de Compostela, Lauzerte is one of France’s ‘most beautiful villages’, and the lovely arcaded main square alone is reason enough for the accolade. Relax there, in one of the bars or restaurants, with a grape juice made from the local Chasselas grapes then visit the peaceful Pilgrim’s Garden in the south of the town for soothing views across the valley below. The breathtaking beauty of the Dordogne is best appreciated while lazily drifting in a canoe. Gently paddle with the flow of the river and you’ll soon be lost in a world of castle-spotting. Or, as an alternative for nature lovers, there are the dragonflies and kingfishers of the wildlife-rich Vézère. The landscape around Bergerac is striped with vines and some of the châteaux offer guided tours – complete with tastings. For an even more prestigious experience, head for Saint-Émilion, a village and UNESCO World Heritage Site that’s also famous for its fine wine. Château de Commarque is a breathtaking ruin at Les Eyzies, with a history stretching back 15,000 years. Complete with Gothic and Roman towers, this is a site to behold – and all the more interesting for its prehistoric caves. Teetering 400 feet above the Dordogne River, Les Jardins de Marqueyssac are 22 hectares of stunning, perfectly manicured gardens. They stay open late every Thursday in July and August for a magical night out. Gliding along in a river boat offers the best view of the village widely thought of as France’s most picturesque. This cluster of honey-coloured buildings beneath a mighty cliff is the photo opportunity your social media channels have been waiting for. La Distillerie Denoix in Brive is renowned throughout the region for its walnut liqueurs – made by the same family since 1839. Enjoy a free taste of their Suprême Denoix and discover why it has won so many awards. Where the Dordogne and Céou rivers meet, Château de Castelnaud, France’s most visited castle, enjoys amazing views in every direction. A lesson in siege warfare and a glimpse at life inside a real medieval castle awaits. The fortified manor house of Maison Forte de Reignac has been built into the rock, its roof provided by the overhanging cliff above. Visits can be paired with a glimpse of the nearby troglodyte village of La Roque Saint-Christophe. The Pauillac Lamb Feast takes place 50km north of Bordeaux. Enjoy the sheep dog demos, meet the famous sheep and enjoy a delicious banquet. La Rochelle’s annual cavalcade is fun for all the family. The weekend-long procession sees decorated floats and marching brass bands parade through the city. Les Epicuriales takes place in Bordeaux where the Avenue de Tourny transforms into an open-air restaurant featuring bespoke menus created by Michelin star chefs paired with great wines. The Festival de la Voix is an annual music festival in Moissac. As well as polyphonic singing and opera, you can catch a cabaret, play or poetry reading. Bordeaux’s annual wine festival lasts four days, filling the city centre with wine tastings, concerts and spectacular light shows and fireworks. The annual Marmande Tomato Festival, 60km northwest of Agen is a two-day homage to the famous “Apple of Love” involving chefs and live music. Red Bull Cliff Diving at La Rochelle is a must-see with divers jumping from the Saint Nicholas Tower in the Vieux Port of the city, a drop of 26m. Un Violin sur le Sable, also known as Fiddler on the Sand, is a free open-air concert held on Royan beach. For three nights, 80 classical musicians take to the stage under the stars. Throughout the month, The Renaissance of the Organ Association hosts many free pipe-organ concerts at Saint André Cathedral, Bordeaux. For dates, visit renaissance-orgue.fr. L’Assiette de Cyrano in Bergerac is a gastronomic festival held over three days, celebrating great food and wine with the chance to sample the very best produce from the region. The Grand Pruneau Show in Agen is a three-day celebration of the humble prune, including sporting events, the delights of the producers’ market and live music. The Autumn procession of The Jurade (Wine Brotherhood) in Bordeaux’s Saint-Emilion is a spectacle of traditional crimson robes, a torchlight procession through the medieval city and fireworks. The Jurade celebrates its Ban des Vendanges – the new grape harvest – marked by the traditional release of balloons.